Wow Janis that made a beautiful Wedding card! I love the burlap lace and embossing together, a really super card!! This is so lovely! Gorgeous muted tones and white-embossed design! Thanks so much for playing Simon Says Stamp Wednesday “Favorite Products/Techniques” Challenge! Oh, this is exactly what your card looks like...a summer breeze blowing through the lace curtains! Those white embossed vellum butterflies are gorgeous and I am just going to have to steal this idea from you SOON! The kraft balances out all the white and is a wonderful contrast. Just gorgeous all the way around! What a lovely wedding card. I like the white embossing, kraft, vellum and the burlap paper. The white embossing on the Kraft card looks really nice. adding the lace to the top and bottom works perfectly.Love the vellum butterfy. Thankyou for fluttering by again for #33. Hugs Mrs A. Your white on kraft card is gorgeous! Thank you for sharing with us at MFP SF&F Challenge. 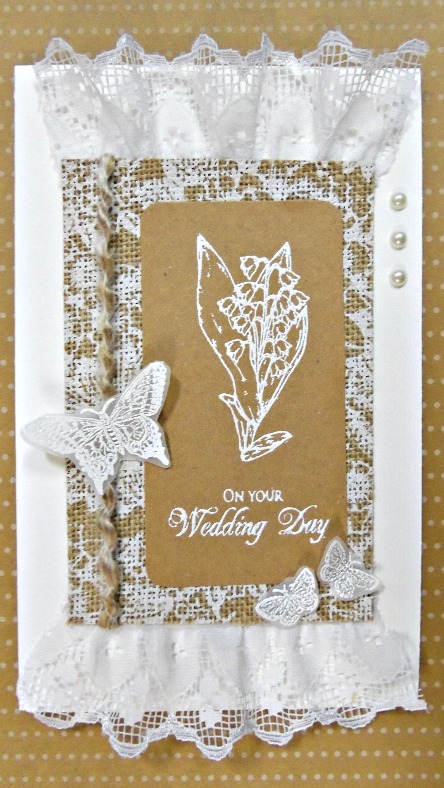 So pretty, the burlap and the lace just make this card. That slightly rustic look is so popular for weddings right now. Love it. Thanks for sharing at MFP's Speedy Fox and Friends.